John and Sherry Petersik do DIY like no one else. On their blog, Young House Love, they tackle everything from simple painting projects to daunting deck building with moxie (and a sense of humor when things don't go exactly as planned). Their conversational style makes them a favorite with first-timers and serial DIYers alike. When I was in elementary school we made dolls out of corn husks. I was obsessed with them and even managed to procure more corn husks from a fall festival to make more of them at home. 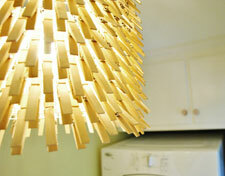 Some of our favorite projects are making lights (we made a clothespin chandelier for our laundry room). And our biggest fail, at least early on (so it hurt the most!) was that I painted all of the trim in our house with flat paint - which (as everyone else seems to know) is a terrible idea. So I had to go back and repaint it all in semi-gloss paint. Not gonna lie, there was some swearing. Paint is our friend. Not only have we painted walls and ceilings and furniture, we've even had fun painting accessories like lamp bases or ceramic book ends. There's almost nothing a little paint can't fix. One day back in 2007 when John and I were especially stressed over some furniture makeover that we were doing (the wood knots kept bleeding through our primer) we somehow came up with this mantra: "relax, it's only decorating." You have no idea how many times we've repeated that to ourselves through five years of being DIY bloggers. For some reason, just remembering that you're not saving a life and you're just decorating a room seems to keep it all in perspective - and helps to keep us laughing. Take it one day at a time. It's incredibly scary to say "I'm going to renovate my kitchen." But if you break it down into small bite-sized tasks, like "today I'm going to unscrew all the old cabinet doors" and "tomorrow I'm going to repaint the walls" it really does make it a lot less intimidating. I think we have surprised ourselves most by DIYing a curved stone patio and a wooden deck. Those were both a lot more about engineering/leveling/permits than most of the other things we tackle, but all that hauling and digging and sweating paid off when the dust cleared and we had two outdoor spaces that didn't exist a few months earlier. We like to ask the "what's the worst that could happen?" question. If the answer is: "the house could collapse", "the house could burst into flames", or "the house could flood" we're usually downright psyched to call in an expert. "When we're not making stuff, we're..."
Singing and dancing with Clara (our two year old daughter) in the kitchen. Every evening we tend to end up in there with the radio on while dinner's on the stove and we have a little family dance party. Dorky? Yes. But for some reason it refuels us so that after Clara's in bed we're ready to tackle something else before collapsing into bed around midnight. 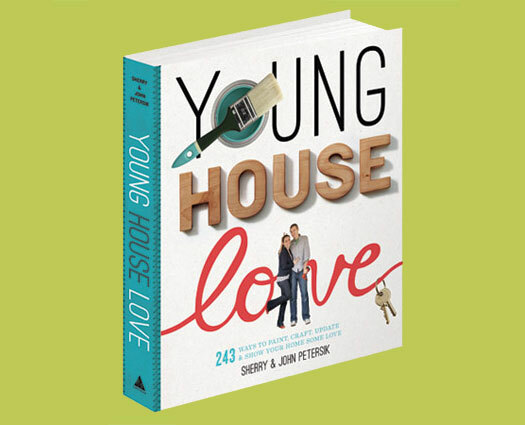 Young House Love: 243 Ways to Paint, Craft, Update & Show Your Home Some Love releases on November 6 on Amazon and at local booksellers. John & Sherry will be signing books at West Elm in Boston on November 7 at 6 p.m.
Shop Tour: Michaels opens in Porter Sq.